Half a cantaloupe sliced on the bias, a croquet wicket with avoirdupois, an upside-down orange half from a Kraft salad, and four little towers and a big tower resembling forms of cubistic coition are the major elements in the South Mall plan proposed—seriously, we presume—for the capital of New York State. Culpable parties include Architects Wallace K. Harrison, George A. Dudley and Blatner & Williams, plus that would-be architect, Nelson A. Rockefeller. A noted selector and collector of modern art, the Governor evidently has a lot to learn about the mother of the arts…. Admittedly, the state is in severe need of well-planned downtown space to integrate the many departments that now occupy ragtag and bobtail quarters throughout the city, but certainly the center of a rather proud metropolis need not become an exercise in architectural pop art. “Half a cantaloupe sliced on the bias.” NYS Archives. 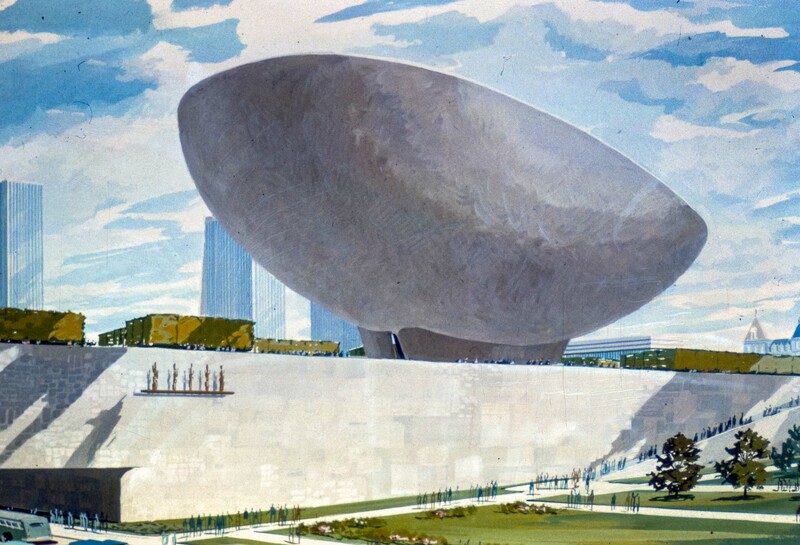 “A croquet wicket with avoirdupois,” aka the unbuilt “Arch of Freedom.” NYS Archives. The following day, the Times Union published a front-page story on the controversy. Reporter Michael Pilley spoke with James T. Burns, Jr., who authored the P/A review. Burns advised the State to “scrap all the present building plans.” He advocated, instead, for a national competition to select a “better, more suitable” South Mall design. This advice would have sounded familiar to most P/A readers. In 1947, for example, the journal’s then-editor, Thomas Creighton, headed a group of architects who complained about plans for the United Nations complex in Manhattan (another Harrison-Rockefeller collaboration), asserting that an international design competition was “the only reasonable and professional way” to select the right firm. 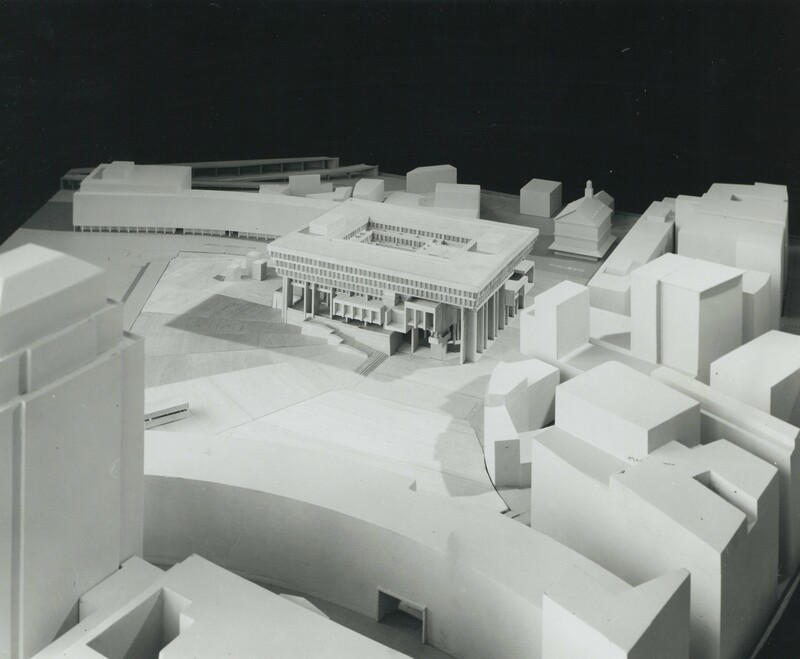 Architectural model, Boston’s new City Hall, 1962. Boston Archives. 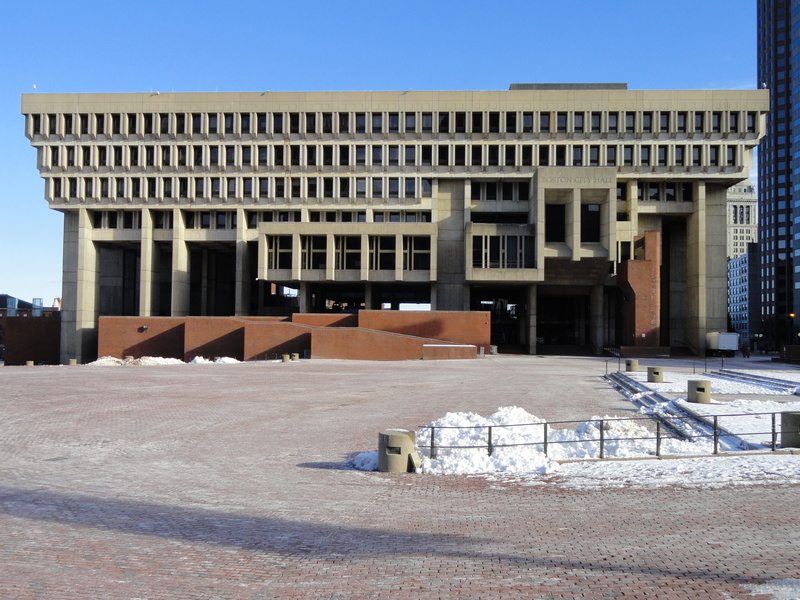 Burns, Rowan, and their contemporaries lauded the design of Boston’s bold, Brutalist City Hall. And they approved of its selection by a prize committee composed of architects and business leaders in 1962. They were not alone. The eminent architect Philip Johnson congratulated Gerhard Kallman and Michael McKinnell on winning the competition, “I think it’s wonderful. And it’s so ugly!” The young architects understood this as a compliment, for they saw their design as a “statement against … decadently degenerate frippery and surface concerns” of an earlier era. In 1969, the new Boston City Hall won an American Institute for Architects Honor Award for its “rich, expressive form” and for harmonizing with the rest of Government Center. Despite the awards and accolades, the popular response to the building has been at least as negative as that which greeted the Empire State Plaza. As soon as the winning design was unveiled, some Bostonians lobbied to prevent its construction. They failed, but the new City Hall remains one of the most hated buildings in Boston. Boston’s new City Hall, 2013. Daderot, Wikimedia Commons. More recently, Albany’s Empire State Plaza (formerly known as the South Mall) has received some critical plaudits, but, like Boston’s City Hall, it remains deeply unpopular with local residents. There are many similarities between the two projects. Both were the product of site clearance and top-down planning decisions. Both sit atop paved plazas, which are largely empty after business hours. And despite past proposals to demolish City Hall, both are here to stay. …. Monumentality always suggests supreme power, and that’s scary. 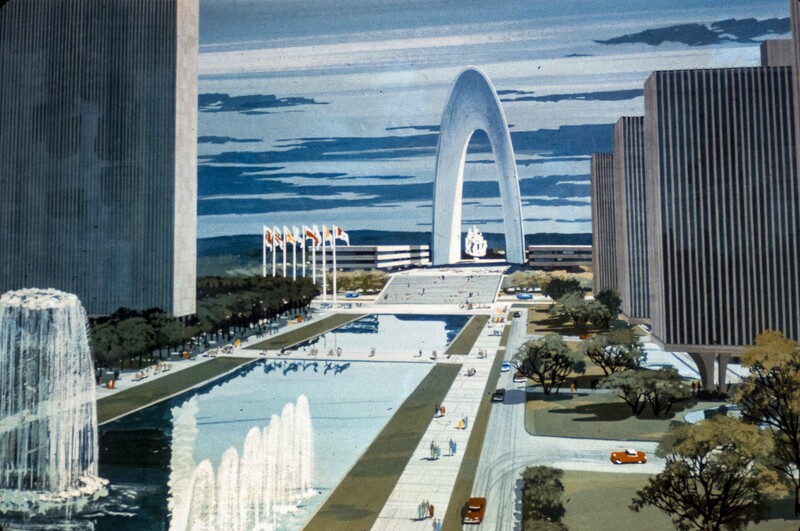 I somehow think that if you could populate the Plaza with more gardens and make it feel more part of everyday life — which they’ve tried to do with farmers markets and using the basin for ice skating — then it wouldn’t feel so hostile. Ultimately it has to do with the sense of feeling included and welcome. When life is allowed to enter, it makes a space feel alive. Then it becomes an outlet for the expression of our democratic values of assembly and freedom of speech. 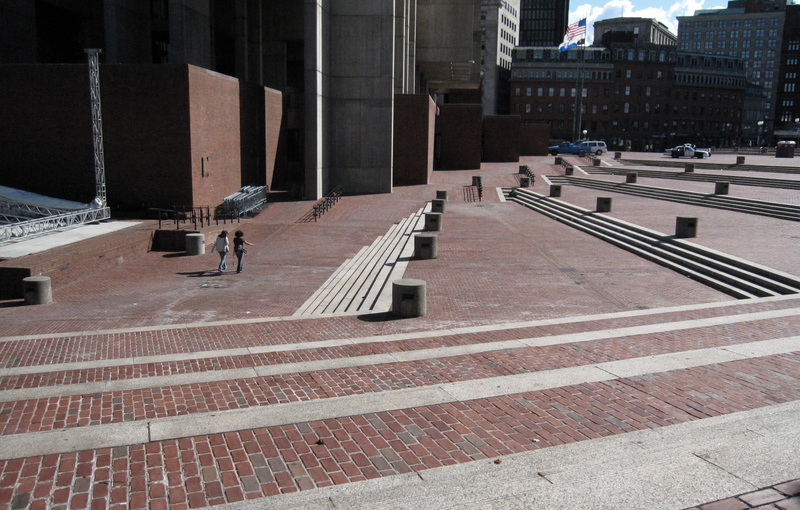 Boston’s largely empty City Hall Plaza, 2009. M2545, Wikimedia Commons. Will this make Boston’s City Hall loveable? It’s too soon to tell. But we think New York should consider following Boston’s lead.